Fractionated ablative laser skin resurfacing treatments like our Sciton Profractional laser, are the most effective treatments available, when used by expert practitioners, for crepey, wrinkled skin, skin with a lot of fine lines or "crinkling", poor texture, and certain types of scars, including those from stretch marks, burns and acne. Treatments can be done on any skin color or area of the body, with just a few days of social down time at the most. Dr. Elliott has been a certified laser trainer for practitioners learning laser procedures since 2007, and she and her staff have performed more than 900 Profractional laser treatments, so you can rest assured you'll safely get the best results possible. 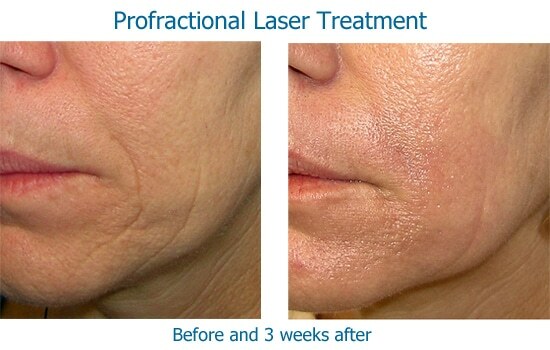 With just two Profractional laser treatments, you can achieve almost as much improvement as you'd get with a full surface ablative laser resurfacing, but with much less discomfort, down time & risk. 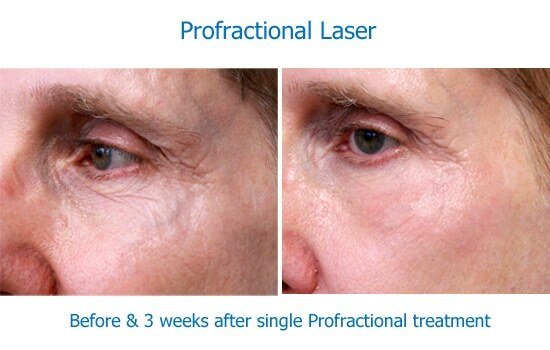 How Does the Profractional Laser Treatment Work? With fractionated ablative laser treatments, the laser beam vaporizes columns of skin to the depth & concentration set by the operator to give you the best results. 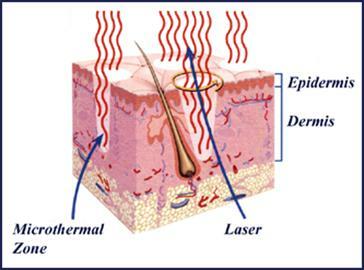 Each vaporized column of skin is replaced with brand new skin faster than if the entire surface was removed, because the surrounding untreated skin reacts by releasing healing substances & growth factors. There’s less chance of losing pigment, infection, or scarring compared to total surface laser resurfacing & there's much less discomfort. 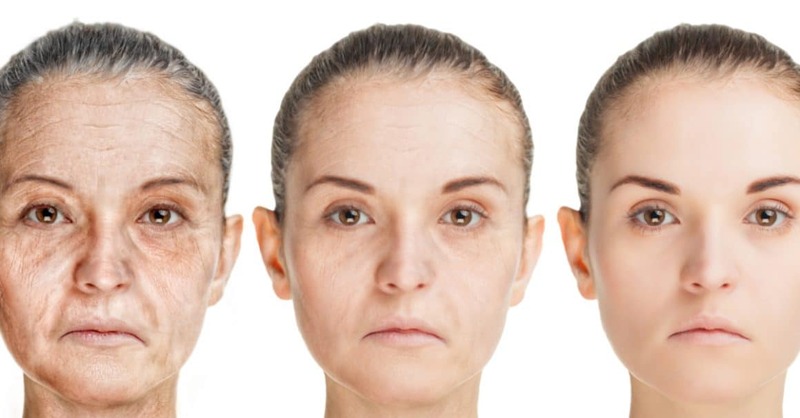 In the last few years we've also discovered that fractional ablative laser treatments replace a percentage of scar tissue with brand new healthy skin and not just more scar tissue. Scars not only become softer, hair follicles and sweat glands return. In this before and after photo of one of our Profractional patients, you can see where shiny, white scar tissue has been partially replaced with normal textured skin (the redness can be treated later with IPL). Anesthetic, medications & other useful solutions can be painted on the treated area during the treatment, to penetrate to the bottom of the channels & produce results not possible with just external application. We’ve been using this method at Skinspirations for the last ten years to deliver anesthetic, collagen stimulating vitamins, & medications to reduce scars & post-treatment breakouts. Delivering anesthetic this way makes the treatment relatively painless. 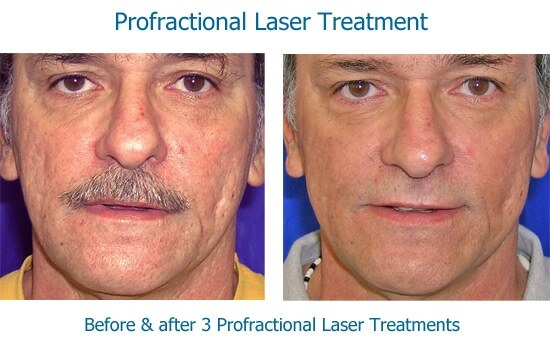 What to expect with a Profractional laser treatment? Like our other resurfacing treatments, a consultation is required before scheduling the treatment, to make sure that this is the best treatment option for your goals, skin and time considerations. On the day of your Profractional treatment, we'll apply a strong anesthetic cream and do a painless dental block if treating the mouth area. When we start the treatment, we do a light pass with shallow settings so that we can paint on liquid anesthetic to penetrate deeper than surface anesthetic can get, which makes the rest of the treatment more comfortable. During the treatment we paint on medications and/or vitamins, specific to your goals and skin type, to penetrate down the skin openings for maximum effectiveness. For example, if treating acne scars, we paint on retinoic acid to help prevent post-treatment breakouts. If treating fine, crinkly skin, we add vitamins to stimulate collagen, or even Sculptra, to thicken skin further. For about thirty minutes or so after a Profractional treatment, the treated areas feel very hot, and we apply cold compresses until it cools down. The treated skin may have spots of pinpoint bleeding, depending on the treatment depth, for the first day. With Profractional treatments for acne scars, there's often also some swelling for a few days. A thick moisturizer is applied before you leave and you'll be given a take-home bag of everything you'll need for the next few days, including gentle cleanser, moisturizer, sunscreen and a disposable pillowcase. We'll also happily call in prescriptions for pain, anti-anxiety and cold sore medicines after your consultation, just in case. From the second day post-treatment through possibly day ten, depending on the area treated and your skin response, the treated area will go from a patchy red to a mild pink. People often believe on the second day after a Profractional treatment that they're going to be too red to go out in public for at least a week, but by the fourth or fifth day, they're amazed by how fast it suddenly looks better. Makeup or concealer can be applied to cover the redness by the second or third day, and we carry the Oxygenetix makeup line, which is a breathable foundation that's good for healing skin. 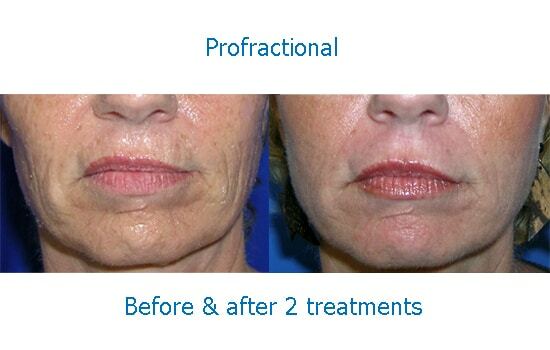 Profractional laser treatments start at $345 and there's a 15% discount on packages of two treatments.